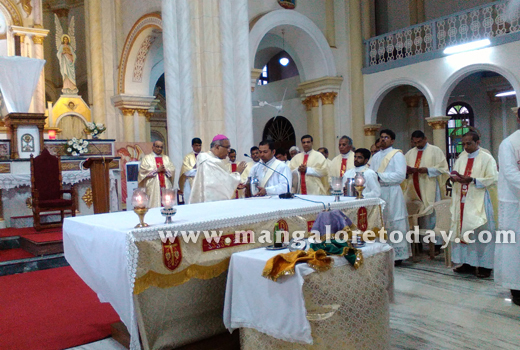 Mangaluru, March 22, 2016 : Yesterday March 21, 2016 Monday, Rosario Cathedral, the principal church of the Mangaluru diocese and seat of the Bishop, conducted the solemn blessing of ’Holy Oils’, during a special mass lead by Bishop of Mangalore diocese Rev Dr Aloysius Paul D’Souza. The Day is also observed as ’DAY of PRIESTS’ . 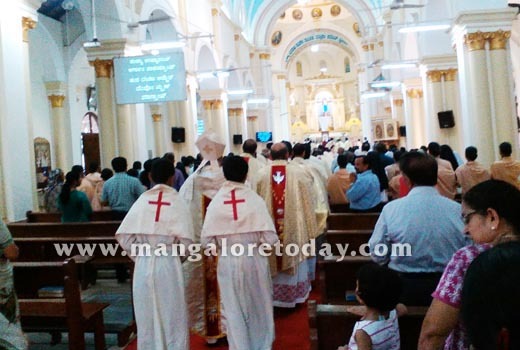 A large compliment of Priests, deacons, seminarians, nuns,religious and the laity were present. After a day dedicated priestly celebration and prayer, the solemn mass commenced at 5 pm, lead by the bishop. 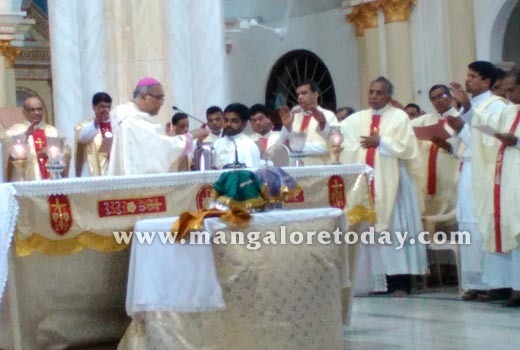 Priests from parishes and institutions of the diocese numbering about 150 concelebrated with the Bishop. 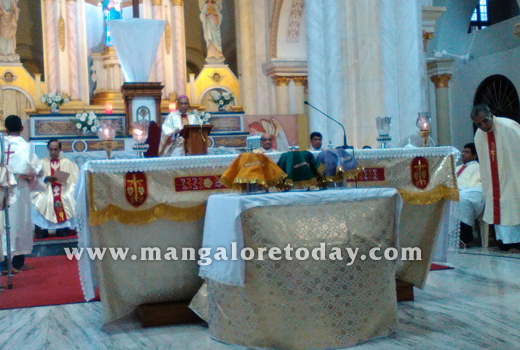 In his homily directed to the priests mainly, he said "This day of renewal of your priestly sanctity and commitment is very special and you as partakers of Christ’s mission in different roles, in parish churches, social action, medical care, education and more is a blessing to society as a whole. Therefore you must strive to live as one with your flock. As Pope Francis has exhorted, ’Live in the smell of your sheep, save the downtrodden like the sick, the troubled, the poor and so on as is the way shown by Christ who is the Master to share in His mission.’ All people will pray and honour you when you do God’s work in a spirit of peace and service on earth." The holy oils required for various religious rituals and anointing were blessed at the special ceremonies. 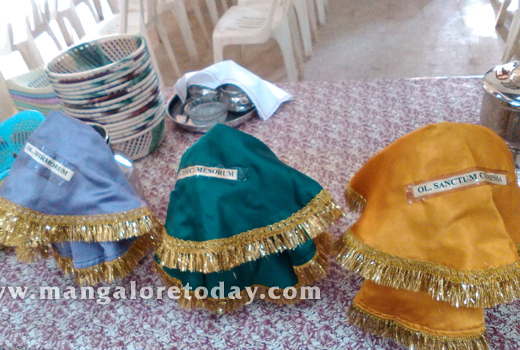 The oils are carried to their respective stations by the priests for use till Easter 2017. 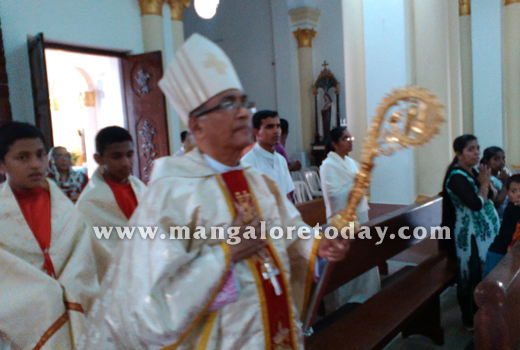 This is a universal tradition of the church followed in all diocese normally the world over. May the Almighty bless all .